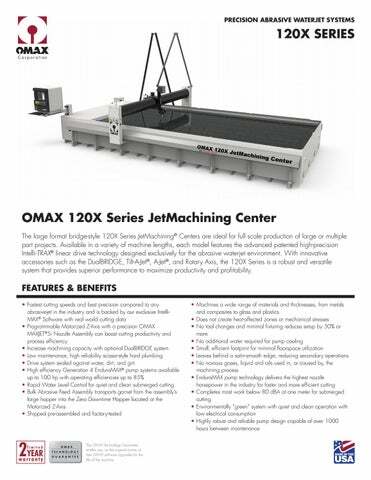 OMAX 120X Series JetMachining Center The large format bridge-style 120X Series JetMachining® Centers are ideal for full scale production of large or multiple part projects. 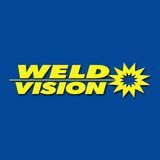 Available in a variety of machine lengths, each model features the advanced patented high-precision Intelli-TRAX® linear drive technology designed exclusively for the abrasive waterjet environment. With innovative accessories such as the DualBRIDGE, Tilt-A-Jet®, A-Jet®, and Rotary Axis, the 120X Series is a robust and versatile system that provides superior performance to maximize productivity and profitability. ABOUT OMAX OMAX is the global total solutions provider in advanced abrasive waterjet systems. Our intuitive Intelli-MAX Software Suite simplifies programming and reduces setup times, increasing your productivity. OMAX engineers continue to innovate technology for waterjet machining, from proven 4th generation pump designs to cutting edge drive systems with micron-level accuracy. With the largest abrasive waterjet support network in the world, OMAX continues to shape the future of waterjets. To see how an OMAX JetMachining Center can save you time and money, call or visit our website and request a free part analysis today.